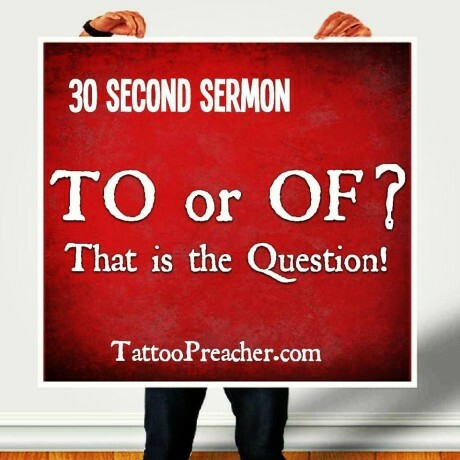 Official Site of the Tattooed Preacher > Kingdom of God > 30 Second Sermon – TO or OF That is the Question! Being sent TO versus being sent OF is significantly different. TO has the additional perspective of an outsider but is often viewed as an outsider because they are. Their position can be respected and influential but is limited if for no other reason than by disassociation… OF is “one of them”… “Family” if you will. OF understands their perspectives, has been in the trenches with them, respects their views and helps shape culture from the inside out. With OF there’s always the barrier of “a prophet is without honor in his home town” but good luck trying to impart child raising wisdom (or discipline) as an outsider (TO) . Properly discerning whether you are a TO or an OF and adjusting accordingly can make all the difference in how your input may be received.